The “Music Mania/音楽マニア” Song Contest Activity! After all of the great sharing from other teachers about their Music March Madness – thanks especially to Carrie Toth and Wendy Farabaugh – I decided to weigh in with my own version. Although March Madness is still very popular here no rth of the border, I’m using it for the last loooooong month of classes (we have our last class June 21)! So on to how I run 音楽マニア (music mania)! The Physical Setup – Taking the advice of those who have already done this I went searching for a ‘bracket’ online. I found a 14 match bracket, and because I wanted 3 qualifying rounds too, added those on to the image. 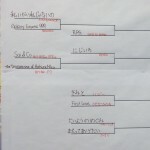 I was lucky to have one of tech-ed teachers volunteer a computer drafting student who made up the bracket and printed it on large paper. Song selection – We use songs for a lot of activities in class and I wanted to put in a ‘mix’ of those familiar tunes. I also constrained the list to ones I had, because I only use legitimately purchased music from iTunes (see previous post on this). For 5 days before the contest I also invited student submissions via a Google Doc Form. That allowed me to ‘purchase’ those tunes in time for the activity. The student selections were all part of the ‘qualifying rounds’ – which allowed us to introduce them in a showcase way. Finally I added tunes that I had purchased but not used in class. Filling Out the Brackets – Songs on the bracket were initially paired via style – in the initial stages I wanted them to have to choose between two that were not radically different from each other. We also included a #1 seed – the song “Zutto” by Spicy Chocolate – a huge favourite especially with my Yr4’s. I didn’t put all the songs on at once but rather in the days before we started I added 5-6 songs per day. This happened at the end of class so I had their attention and helped to build interest/excitement. 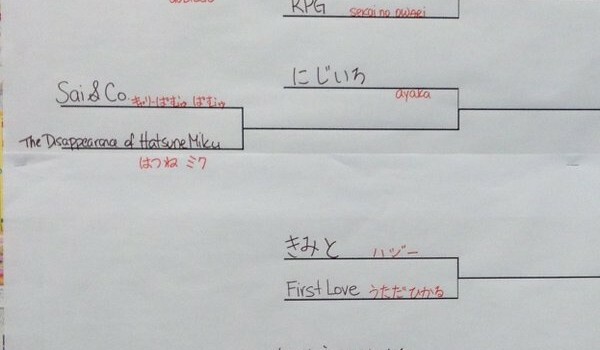 I will note that after the brackets were set I made one change due to a mass outcry from my classes that no tunes from the group “Baby Metal” had made it into the contest! (I bend to their will!). Playing songs – The song battle of the day is listed on my white board each morning. For playing, I use iTunes and have created a special playlist. Each day I drop the two songs into it and then play them once each while we all listen. After that, during class and in the background we ‘play on loop’. I learned that iTunes learns what you want and after having to edit the playing order in day one to alternate the songs, iTunes alternates the selections for me now automatically. I chose not to use ‘videos’ of the songs – the audio only. This allowed me to avoid the potentially inappropriate video problem or the ‘can’ t find the video’ issue that sometimes arises. Voting – We are not a very tech-friendly school (don’t ask!) and I wanted to capture the voting right away. So I prepared voting slips for each day – a basic one where they would enter the two song names and then say why they chose the song that they did. But I wanted some accountability – some ‘participation by them’. So I asked my students and one of my great Yr4’s Abbey McLane, thought of a great idea. “Why not have us pick out two words we recognized as we listen?”. Great idea and one that all levels of my classes could do. I have the voting slips in the baskets on their tables of 4 and now they enter and automatically fill them out. I read all the voting slips and it is amazing the variety of words that they select. Voting occurs at the end of class after we have listened to the songs fully one more time. I note that one day my Yr3’s were called to an assembly so I loaded the songs online & included a Google Form link so that they could still participate. The Verdict – We have really enjoyed this foray into listening. And, with classes ending in late June it’s a great diversion at the start of class. Some kids are really into it…others just listen then move on. But today, as the 2 songs continued to play in the background, I looked across to see one of Yr4’s singing along with the tune. Loved it. I may/will modify in the future but I will do Mania again. I’m hoping it will be one of those ongoing class traditions! PS The Final Four? “Zutto” from Spicy Chocolate, “Nijiiro” from Ayaka, “Taiyou no Megami” from Ieiri Leo and “Kimigainakya damemitai” from Ooishi Masayoshi! I’m going to try this starting next week 🙂 Thanks for all the ideas!